MagicScore Maestro 8 allows you to turn your musical ideas into clean, playable, and easy to read music notation files by using one of the most powerful and customizable music scoring systems on the market today. With MagicScore Maestro you can create clean, engraver quality prints of your music with a minimum of effort and time. You also get all of the features found in our Maestro Notation program, plus the ability to have total musical control over every single note in the entire composition. When the creative mood hits or a deadline looms you want to be able to get your musical ideas down quickly, easily, and accurately with many different presentation options. 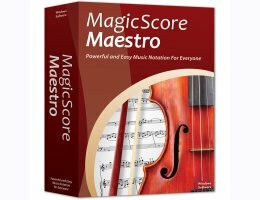 MagicScore Maestro provides all of these things within a set of features that rivals all other professional level music notation and composition products. MagicScore Maestro provides you with a dozen different ways to enter notes into a score while also making it possible to listen to the music as you write it. With nothing more than the computer keyboard musicians can speed through an entire composition by using MagicScore Maestro’s Quick Input mode or use a mouse along with a variety of other note entry methods such as step time and real time note entry with a MIDI keyboard. You can even enter notes using our handy on-screen piano keyboard or virtual guitar fretboard. Extracting and printing individual parts from complex scores is easy to do and allows for each part to be customized and formatted as desired by the publisher. Rewrite or transpose existing scores for other instruments with just a few simple mouse clicks. Each individual element in a MagicScore Maestro score is able to be edited and moved wherever the composer desires. Simply point and click on clef signs, brackets, bar lines, articulations, or individual notes to place them precisely where you need them on the page. These powerful visual layout tools are matched with an equally powerful set of options that, if needed, can help a composer fine tune audio playback to control details such as the attacks and releases of individual notes. Full ensembles or individual instrumental parts can then be played back or exported directly into high quality MP3 or WAV format audio files using realistic sf2 sound fonts. Completed scores can be saved and printed in many different ways using MagicScore Maestro. Scores can be printed, exported to Adobe PDF format, saved as SFD (our own music notation file format), or as MusicXML, MIDI, or KAR (Karaoke format) files. Completed pages can also be saved in many different graphics formats including JPG, GIF, PNG, BMP, TIFF, and WMF in resolutions of up to 1200dpi. For those that want to share their documents on the web, users can upload their saved files to a web site and directly embed their scores into any web page, giving visitors the ability to play, listen, transpose, or print the music as needed.